A Sulfate and Paraben Free shampoo formula fortified with Argan Oil, Apple Extract and a high percentage of gentle cleansing ingredients. To this formulation we add special essential oils, extracts and botanical's. This shampoo clarifies without over stripping, and also contains beneficial ingredients that add shine, moisture and antioxidants without weighing down hair. This particular formula is great for use on normal to oily hair, or if you've noticed that your favorite styling products just aren't working like they used to. For dry over processed hair, occasional use is recommended to reduce the buildup of old styling product. 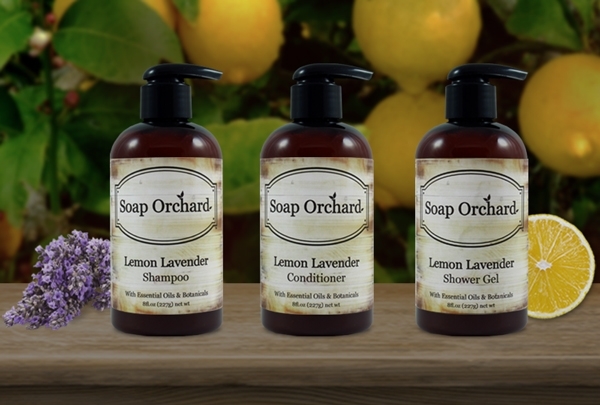 Soap Orchard's Reconstructive Conditioner is the important second step in maintaining healthy hair. Our Conditioner base boasts a unique formula that adds shine and body to normal or fine hair. It even works well with dry hair while repairing problem areas. It works wonders without buildup. Plus, it's a great detangler! It is fortified with conditioning moisturizers derived from coconut, which give your hair that silky feel. We also add vegetable protein. Due to the moisture retention capacity, the result is a conditioner with unique hydrating capability. These proteins are attracted to dry damaged areas of hair, giving those areas added benefit. Resulting in even balanced conditioning. It is pH balanced and fortified with Vitamin A, D and E. And its Paraben Free! The result is hair that's well-balanced, nourished, and simply beautiful!